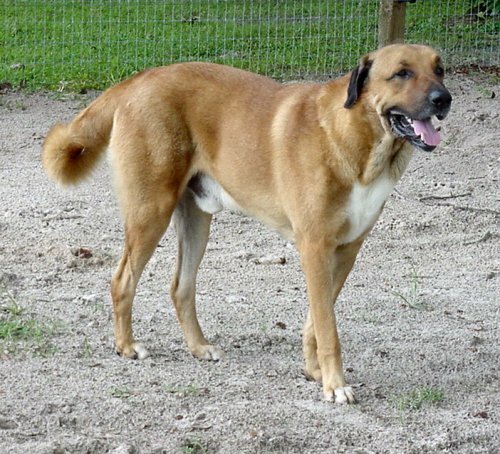 Our experience treating 2 dogs with poisonous snake bites. Recently Red, our 2.5 year old male, was bitten on the muzzle by a poisonous cottonmouth snake. The 18" snake had been ripped in half. Two of our females were staring at the head and another, Mimi, was eating the remaining piece – actually she had eviscerated it. This was our first experience with a poisonous snake bite and we were frantic trying to identify the snake and figure out where to take Red. 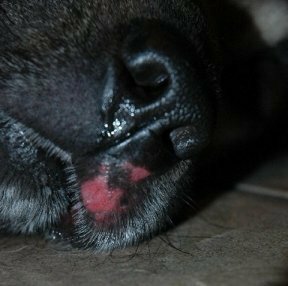 With his face beginning to become severely swollen, we rushed Red to an emergency clinic - a normally one hour drive took us about 30 minutes.1 Red was immediately given IV antivenom, fluids, morphine and an antibiotic. Within about 3 or 4 days, his facial swelling had subsided and he was virtually back to normal. All that was left were 2 small scars on his muzzle – telltale signs of the snake’s fangs. 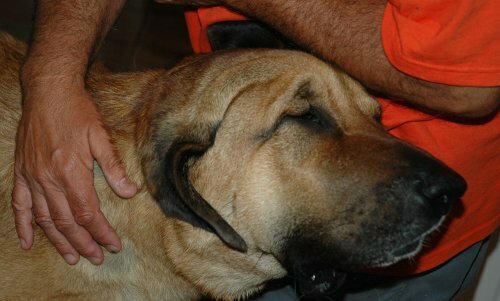 The bite caused a great deal of swelling in the muzzle and in the eye area. Several weeks later I came home from grocery shopping. When I opened the car door, I heard Red barking a loud, frantic alarm from the goat paddock which is located behind our barn. I ran through the house which was the shortest route to the barn and goats. When I opened the house slider, there was suddenly and momentary, eerie, dead silence. Now in full panic, I ran to the barn, shouting Red’s name. He ran to the front of the goat paddock so I could see him. Three dogs came running out of the barn, but there should have been 4 – Mimi was missing. 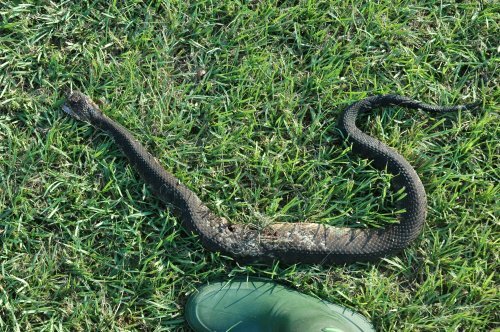 I fumbled to unlock the gate, raced into the barn and it was then I saw a huge cottonmouth snake about 36 inches long stretched across the west side barn ramp - alive and well. I grabbed the leashes and began to remove all the barn dogs, but still no Mimi. I was screaming, “SNAKE, SNAKE” to Henry, trying to get his attention. I was shouting and still removing animals from the area when he came out and ran to the ramp. I heard the shots – later he told me 2 - and one in the side “for Mimi”. It was then that Mimi finally came out of the barn with her tongue hanging loose and her face dripping blood. We thought the bite had been in the tongue. We made some phone calls and with the help of our vet, located some antivenom. We raced her to the hospital, where she received antivenom, morphine and fluids. We learned her bites were close to her nose and not the tongue as we thought. She had a great deal of swelling, but was doing very well within 3 or 4 days. If it were not for Red’s loud warning barks, Mimi would certainly have died. We have been told there is about a 4 hour window in which to receive the antivenom. I probably would not have done a detailed check on the animals until about 4 PM which would have been a 5 hour span of time – and too late for Mimi. We know Red saved Mimi, but what other animals did he save? The snake was headed toward Red who was in the goat pasture with another anatolian. Red is a simply awesome dog and gets lots and lots of special attention for being such a superb guardian. Our beautiful Mimi The second cottonmouth found in the barn. The boot is 10" long. 2 shots and one in the middle "for Mimi". After these two episodes, our biggest fear is that another dog will be bitten and antivenom will not be available - then what would we do? We have learned that many vets without antivenom will treat for shock. That treatment includes steroids, fluids, antibiotics and keeping the animal quiet. There is also a vaccine for snakebites but that seems to be unreliable with antivenom needed even with the vaccine (click HERE to read a story about a very bad reaction to the snakebite vaccine). Antivenom is also extremely expensive and so may not be an option. 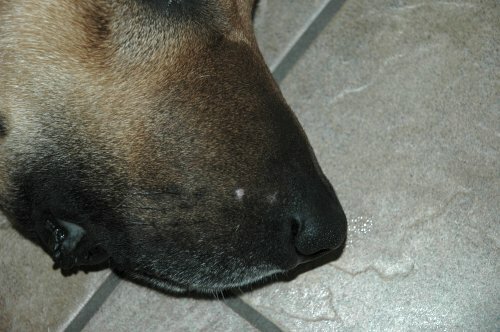 After a snake bite, the dogs fluids from the bite are dangerous, so they should not be touched without rubber gloves. There will be a great deal of swelling in the area. 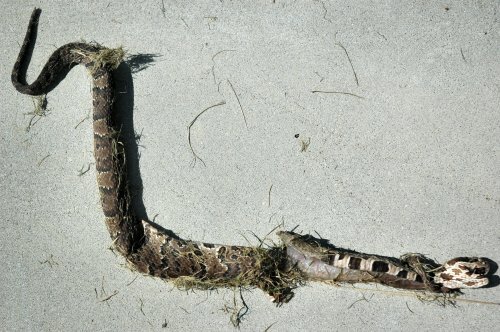 The snake's head should be removed and buried or dumped where no animal has access to it, as it still contains venom and is very dangerous. Bring the dead snake with you to the vet if you are not sure you have identified it correctly. The degree of damage inflicted by a snake bite is determined by a wide variety of variables - the age and species of snake, the intensity and depth of the bite, the amount of venom injected, the location of the bite, and the size of the dog. 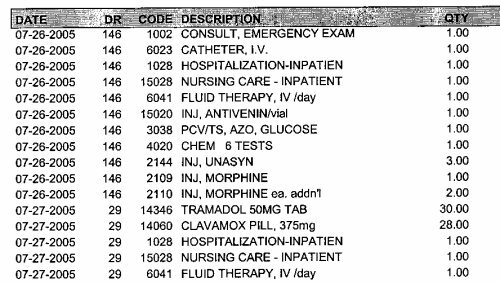 Above is a scanned copy of Mimi's hospital invoice. You can see that one vial of antivenon was used - smaller dogs very often need 2 vials. Lab work is done to be sure the venom has not damaged any system or part of the body. Unasyn is an injectable antibacterial. Snake bites are very dangerous not only because of the anivenom, but also for the amount of bacteria - almost 100 types can be found. Morphine and Tramadol are for pain. 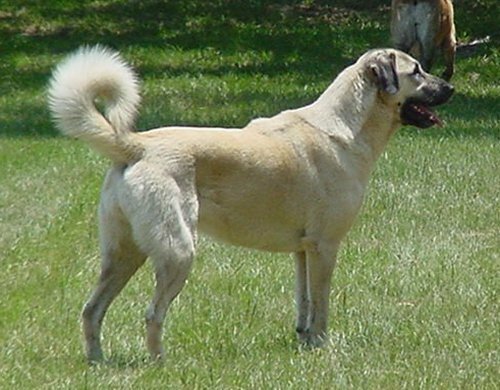 Click HERE to read about a bad reaction one dog had to the vaccine. 1Not knowing exactly where this emergency clinic was in the dark and due to lots of construction, we were driving slowly. We were pulled over by a police officer because unknown to us, our rear tail lights were out! We learned later a fuse had blown. We told him about Red and he showed us where the clinic was, arriving along with us. With Red's emergency and the police car arriving, the employees came running out to us. I grabbed Red and raced him to the door. It was then I realized I had never completely finished getting dressed - my blouse had only one bottom button fastened and my pants were never zipped. I looked down to see myself quite exposed to the staff! But at the time, it was the least of my worries. Click HERE to read about a bad reaction one dog had to the snakebite vaccine.